The International Landscape Lighting Institute (illi) is a not for profit organization encompassing all aspects of landscape lighting design and education. It is located in Troy, NY. In 2013, on the Institute grounds, a permanent Landscape Lighting Exhibition was created to show lighting contractors, landscapers, garden designers, landscape architects and all other related trades good landscape lighting. The design process started in March 2013 when 27 designers from all North America met at the Institute to design the lighting for the permanent exhibition. The power distribution was done the following June and the installation was completed in September 2013. 15 low voltage transformers - with loads varying from 75W to 900W - power the Lighting Exhibition. When came time to control these, long time illi supporter Eric Beaudin from Solutions Aquasol volunteered to design and donate the equipment required to control the Lighting Exhibition. Evolutive: the illi is a young entity and there are numerous projects on the drawing boards. The control systems needs to evolve along with the Institute. Sturdy and reliable: The exhibition will be on every night for years. The equipment must operate flawlessly. Since there is no permanent technician on site to maintain the equipment, sturdiness and reliability are critical. Open source protocol: The control system must not rely on one specific manufacturer proprietary technology. An open source protocol will ensure future equipment compatibility, a pool of knowledgeable people to service and operate the equipment, and a great quantity of support information online. Ease of operation: The system should require a minimum of knowledge for the users to operate. Eric decided to select Johnson Systems J-PACK Series Relay Packs to turn individual transformers on and off. 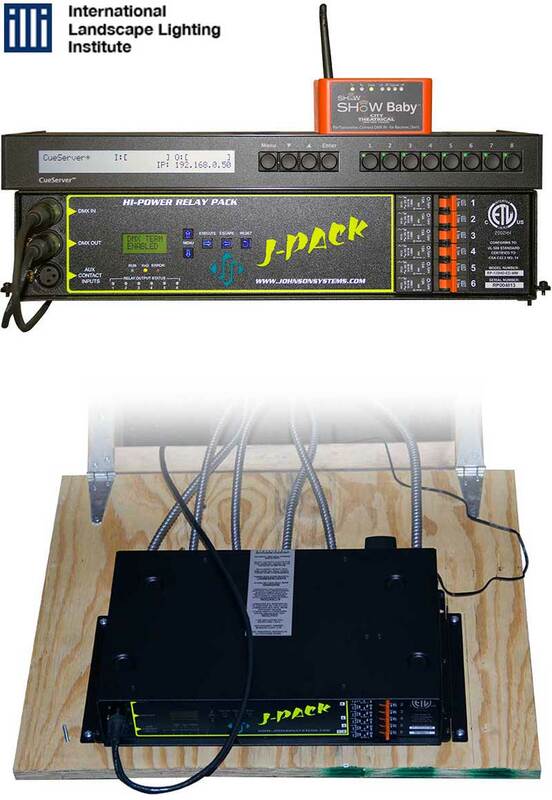 JSI's J-PACK Series Relay Packs are simply DMX relay packs. Each transformer connected to the relay pack is assigned a DMX address and can be controlled individually. Since power is distributed from 2 buildings, there is a relay pack in each building. Since they are built to sustain the abuse of touring, the J-PACK Series Relay Packs are extremely rugged with lots of safety features built in. Interactive Technologies Cue Server CS-800 was chosen to control the relay packs. The Cue Server is a web server that can be access through a local network or from anywhere in the world with an Internet connection. An iPhone or iPad application makes it easy for the user to trigger zones or scenes once the initial programming is done. City Theatrical's Wireless DMX unit was employed to transmit the DMX signal from the Cue Server to the J-PACK located in the second building. The system has been working flawlessly!